This is the first post of a Halloween series where I will highlight inexpensive and easy homemade costumes. As a child (the youngest of five) buying a costume from the store was unheard of. I think I convinced my mom to buy me a witch costume kit once and was horribly disappointed and felt guilty for weeks that she spent money on something I secretly did not want to wear. Halloween is only one night a year and the costume is worn for a few hours - search for what you already have, invest in a glue gun, a couple yards of felt, and you should be good to go. I bought these pants for Parker at H&M in NYC for Christmas last year. Every time Parker pulls them out to wear, I can't help myself from daydreaming up costume ideas. Here are five of my favorites. 1. Old fashioned pilot. I bought this hat off the sale rack at Gap in 2011. It fit him then, and it fits him now. I cut a scarf out of felt and tossed him in a white t-shirt. Take this look a step further by investing in a bomber jacket - justify the purchase by insuring that it can be warn in both fall and spring. 2. Hipster. It is all about the props. 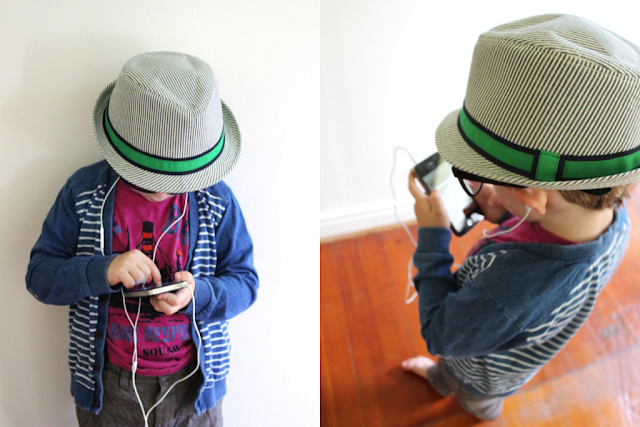 Give your little one a fedora, cardigan, and some black frame glasses. Then top it off with an iPhone with headphones in and you are golden. Take this look a step further by using a to-go Starbucks coffee mug as the trick or treat "bag". 3. Old man. 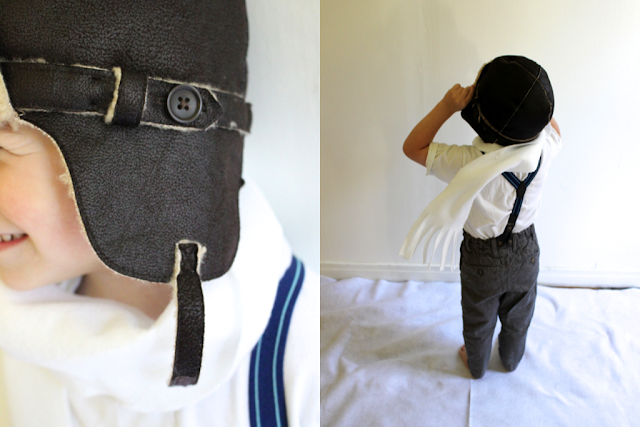 I know this has been done a million times, but really, dressing toddlers up like old people is adorable. 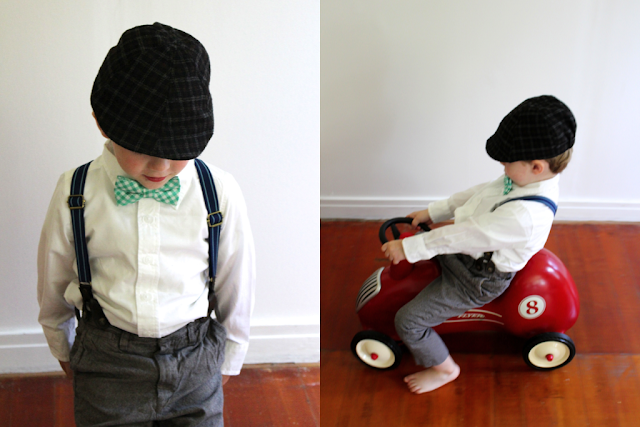 Plop on a flannel hat, a button-up shirt (buttoned all the way) and a bow tie. Then get fun with props. A newspaper, cane, or walker would all be considered excellent props. Parker choose his toy car because "old people drive places". 4. 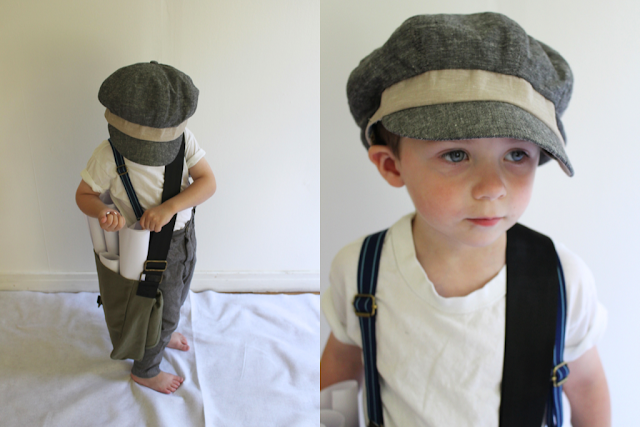 Newsboy. I don't even know where this hat came from, but it works. Add a satchel with some newspapers and teach your kid to shout things like "Extra! Extra! Read all about it!" 5. 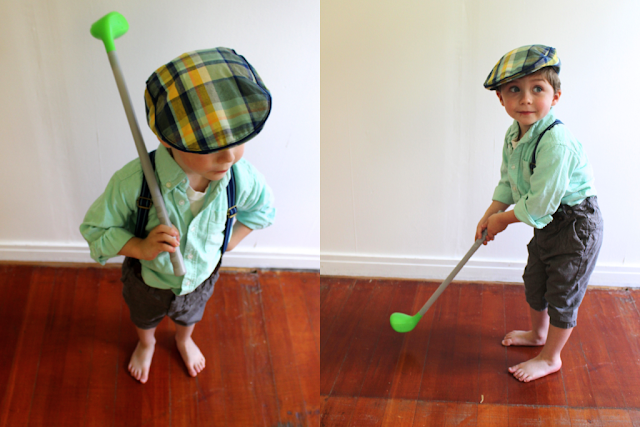 Golfer. Tuck the bottoms of the pants up to appear mid calf, and then add matching shirt and hat (these were both found at target). Take the look a step further by adding argyle socks! This mini golf set is sold at Walmart for about three dollars. It even comes with a little bag that could easily be converted into a trick or treat bag. So there you have it. 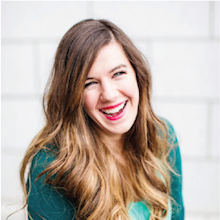 Five easy costumes from items found at home. I would love to hear your favorite costume ideas!